The terrain must be unusually fertile as brain food. And since what one today tends to call creativity is busy at work there driving things, such earth spawns any number of visions. That someone prone to them, someone praising them with many words or skillfully circulating them in networks should therefore consult a physician seems to be a completely out-of-date suggestion. Progress needs visionaries and visions, today evidently even more so than ever. In Medieval times, visions were essentially the privilege of saints, whereas today just about everyone has them, or has to have them in order to be able to survive in the so-called creative industries. Economics, as we all know, is largely based on imagination and suggestion. Meaning that not only are many competing to come up with the most offbeat vision of what we are going to face; ever more frequently, visionaries today also have the capital to advertise lunar space suits, vacation flights in orbit, downloads of brain content, terraforming, the settlement of Mars or pneumatic post for people – and to initiate the first steps to realize their plans. Now one could at present claim that in step with the rise in the number of visions, so the probability of their realization dwindles – but that says absolutely nothing about whether in individual cases they can essentially be realized or will not, contrary to all expectations, overwhelm us anyway. So to recap: Visions are one thing, whether they should be realized, however, another. Those troubled times when the goalposts are shifting seem to be especially prone to highly promising visions. This applies to the present, and to architecture. Looking back at the last century, in the late 1920s and early 1930s, and again in the 1960s and 1970s, the belief in the changing power of visions, coupled with new technologies, surged like an epidemic and found its way on reams of patient paper and models. To claim everything people dreamt up back then and hoped would be realized was so much messing about would be to negligently ignore the analytical and prognostic power of such visions. However colorful and fun they may in part be, even the most visionary and bright city creation focuses on using space and providing therapy stations for life in technoid-alienated feelgood zones that had literally lost the ground beneath its feet. Take Friedrich Kiesler – who acted alternately as artist, architect, designer, poet and theorist – worked in the name of a future that thrived explicitly on inspiration. (The fact that he is cyclically named as a source of the same may have to do with the fact that today even those whose intellectual metabolism is not cut out for it have to believe they thrive on the inspiration.) His leitmotif was, to reduce it to a formula: “Function follows vision, vision follows reality.” To this day, his “Endless House” is an icon of visionary architecture. Although or precisely because it was never built, it shows how fundamentally the concept of space changed in the course of the 20th century (relativity theory + media). While in physics space has lost its fixed structure, new media technologies running in real time have also reduced it to a non-expansive nothingness in our everyday experience. And architecture is hardly up to the task of structuring space without qualities. It suffers a bit like the man without qualities, who, so Musil once wrote, is a man without a system in a world without system. Small wonder then that in his “co-realism” Kiesler advocated the “image of the direct inter-swirling of environments”, eliding any walls between objects, habits and wishes. We experience much such inter-swirling on a daily basis. 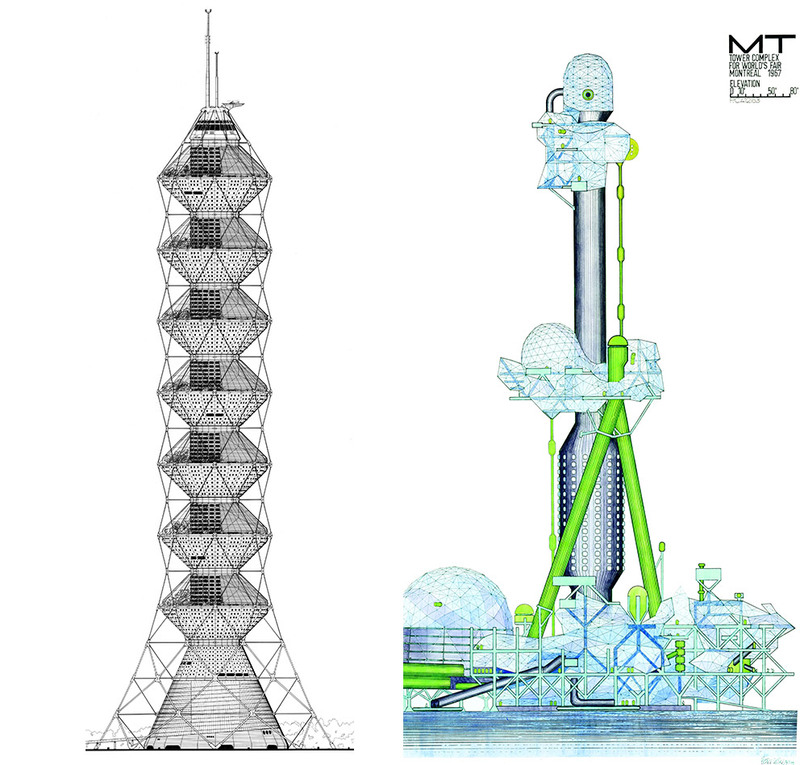 Also worthy of mention here the ideal cities created by the architects and designers of the “Superstudio” group, Archigram’s “living”, “walking” and “plug-in” cities, so inspired by Pop Art and the moon landing, and the living capsules designed during the Cold War by “Future Systems”. And last but not least “New Babylon”, the models by Dutch painter and sculptor Constant that oscillate between utopia and dystopia. 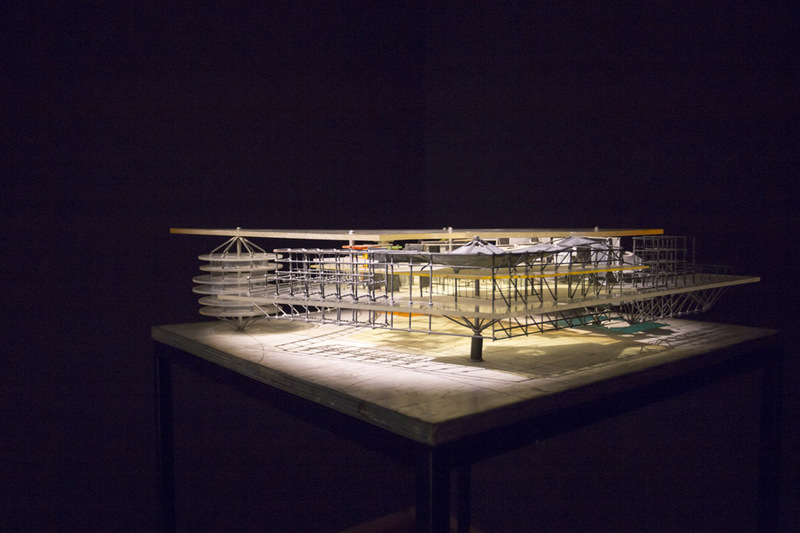 Deutsches Architekturmuseum DAM, for example, is currently hosting a show entitled “Yesterday’s Future”, cameoing visionary designs by Future Systems and Archigram, Kiesler’s work is on display in Vienna’s MAK, Constant in The Hague, and Superstudio designs are to be viewed in Rome. 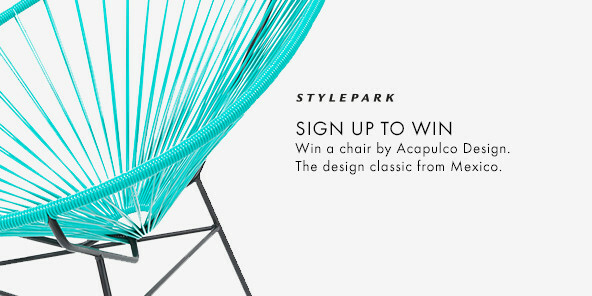 So why the sudden aggregation of historical future visions in architecture? Why are yesterday’s visions of a real or already past future of tomorrow all the rage again? Is this simply some coincidental bubbling up of nostalgic feelings with which we at time masochistic contemporaries take stock retrospectively of how great it was when the future did not consist of threats such as climate change and big data theft? Do we simply need cheering up and find succor in yesteryear? Or are we alternately technocratic or apocalyptic/dystopic fans of all things contemporary consulting the archive of visions to scrape the very last glimmer of hope from it? Both seem as trivial as they are improbable. The function of such retrospectives wobbles overly between confidence and fear in the tormented souls of architects and curators alike. Seemingly hard to assess their impact on the general public waiting with agitation for affordable and safe housing. So what is that makes such visions and utopias now seem attractive? Historical interest alone it can hardly be in our age of ignoring histories. 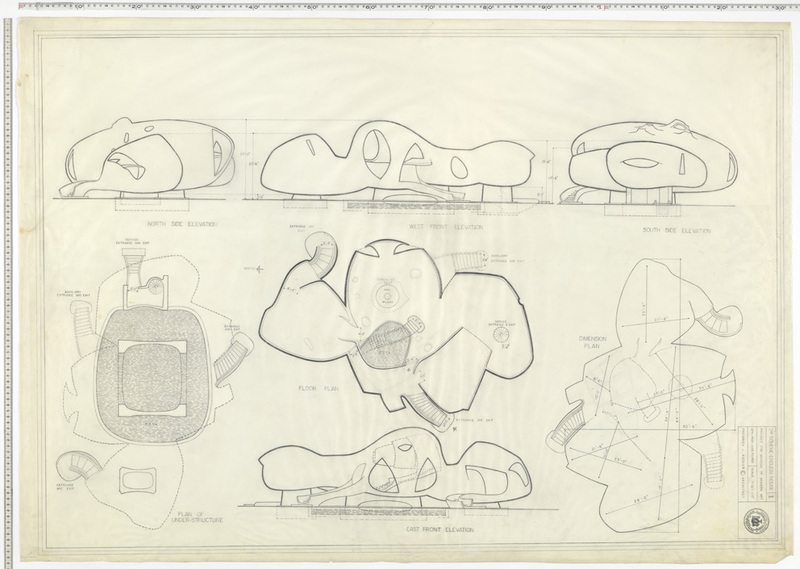 It is clearly time to start rethinking changes in how we conceive space: drawings for Friedrich Kiesler’s “Endless House” dating from 1959. One possibility: Given the almost ubiquitous predictability and uniformity of current architecture (either all showy or boring investor-driven boxes, both of which are essentially tedious and unnecessary), the museum-based visions function as stimulants and change accelerators, liberating the eye for a moment from its frozen focus on the rigid. That a large part of these utopias remained confined to paper and were meant to encourage survival/life in times of massive social change, makes us feel good and proves: Things can be different. The “spirit” of the unfinished tends to speak to us more from the texts than the models and has the feel of a free-of-charge shot of cheer for the mind. That’s always been the case with avant-garde wishes and fantasies and will remain the case: They purge the ossified brain, create new free scope and forge new links in thought. But one thing the visions must not be: realized. They were intended to be, even if their producers should have claimed the opposite. 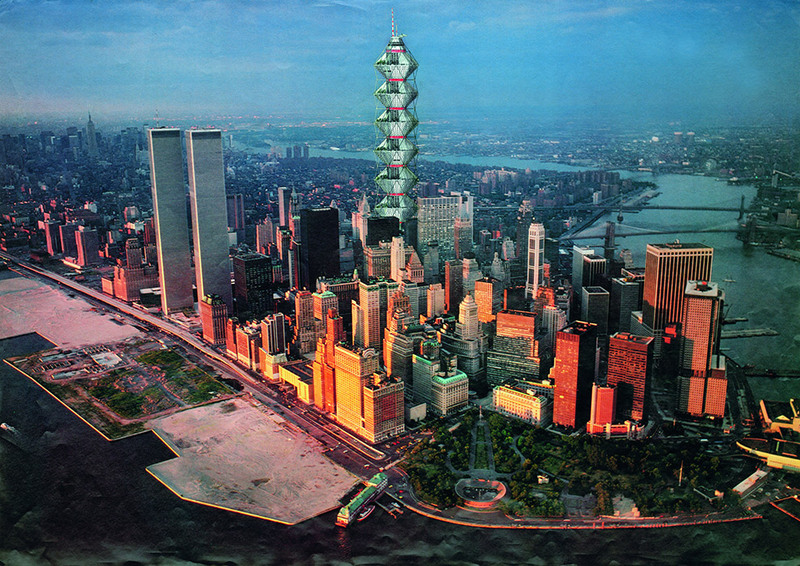 Moreover, it is noticeable that at least in the 1960s and 1970s it was repeatedly capsule concepts, plug-in modules, serial cell structures and cities that floated above their bases on Earth or moved of their own volition that were championed as desirables, even if at the end of the day it is never clear: Is this euphoria or a warning? Is there perhaps a causal basis for such ambivalence? 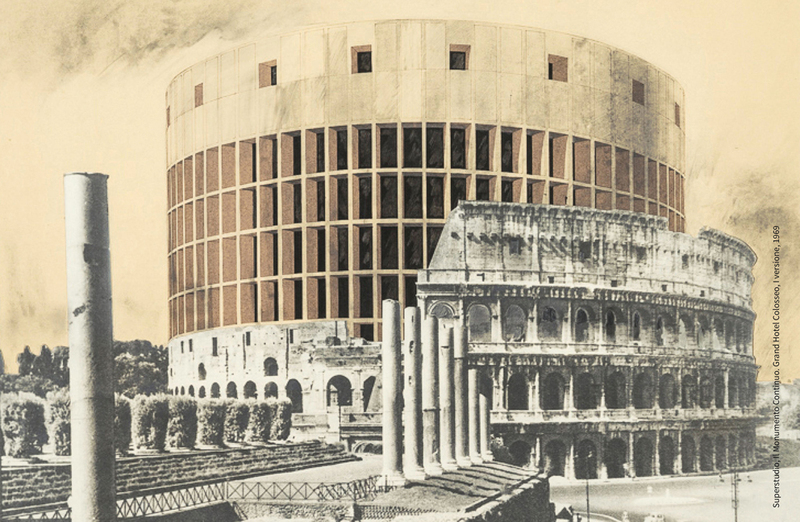 Strategies for exaggerating things have always been part and parcel of visualizing something: “Grand Hotel Colosseo” from the “Monumento Continuo” series by Superstudio. Architecturally speaking, such highly promising atmospheres management has since the 1970s be increasingly replaced by uniform, profit-driven investor architecture – which means nothing other than that the blossoming dreams have past and the jukebox of atmospheres simply plays the same boring songs over and over. Therefore the wish machines of the past are invariably being revved up again. Seen thus the return of past visions of the future is most certainly not a nostalgic act. On the contrary, it can be read as an attempt to re-address a reality in which we have forgotten how to handle permanent migration and its nomadic and poly-atmospheric consequences. Incidentally, such an analysis sheds a slightly less optimistic light on Alejandro Aravena’s report from the front at the current architecture biennale in Venice. Under the pressure of atmosphere management, and it has long since infected politics, architecture and urban planning globally, many of the ideas presented in Venice seem as anachronistic as the proposal that we draw swords to fend off drones. So let’s stop pretending: People have long since started planning settlements on Mars. However, this is happening largely unnoticed without rockets or space suits – between Caracas and Offenbach. If it is not just left to investors it will need new fuel. Which can be found in books and museums.